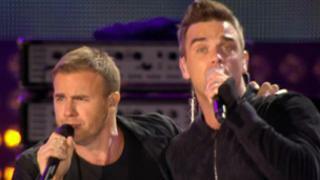 Robbie Williams and Gary Barlow have performed live together for the first time in 15 years. The Take That pair, who announced this year they were working together again, performed their new single Shame at a Help For Heroes concert in London. Earlier, Barlow and Williams said: "It's great that people like Shame so much and we can't wait to perform it live for the first time." Also in the line-up were Tom Jones, Alexandra Burke and Pixie Lott. The concert, which is taking place at Twickenham stadium and is also being shown on BBC One, also featured comic talent including Bruce Forsyth, Peter Kay, Michael McIntyre and Jack Dee. Some 60,000 people were at the event - including 150 personnel injured in combat who attended the show free of charge. Proceeds will go to the Help For Heroes charity, which raises funds for wounded troops and their families. Williams, who recently announced his return to Take That, said he was "honoured" to be asked to take part, and paid tribute to UK service personnel engaged in Afghanistan. "Their dedication to our country is phenomenal and we are all so proud of them," he said. Katherine Jenkins, James Blunt, and The Saturdays were among the other music acts.